Maui Kamaole I205: Thank you so much for letting us stay in your beautiful Maui Kamaole condo. It had everything we needed and we loved watching the sunsets from the patio. The Nintendo Wii was so much fun, too- we had a great time! We'll be back! 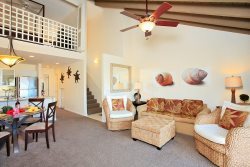 Kamaole Sands 3BR: We really enjoyed our trip and the condo was wonderful - looked even better in person than in the photos! We loved the thoughtful touches such as the treat basket (thank you! ), shampoo and body wash, detergents and hair dryer. Having all the beach gear was wonderful, too. Palms at Wailea 2303: Thank you so much for our wonderful stay in Maui. The condo was just perfect. (Palms at Wailea, #2303) We felt it was quiet, beautiful, secluded, and in a beautiful home area, which we loved! ! ! We took a walk every morning on the beach, my girls were in the water snorkeling or sunbathing or in the condo pool every moment of every day, when they weren�t looking for boys that is. It was just great. Thank you so much for hooking us up with such a wonderful place to unwind. My husband & son weren�t able to go with us, due to my son playing little league all stars tournaments, so my best friend and her sister joined me last minute and my daughter had her best friend, so it turned into an all girls, best friend vacation, much needed, much appreciated. We hope to book a family vacation again sometime in the near future with my husband & son this time, I will call you when we can do that. Thank you again. Maui Kamaole I205: We wrote a short "thank you" in the book but I wanted to say a special one to you and to let you know how much we all appreciated both the beautiful accommodations and also all your help. The condo is Gorgeous and so well equipped that it was unbelievable! We had planned on spending several evening going out, dinner, drinks, etc., but we ended up sitting on that lanai with that spectacular view and just enjoying our surroundings. Trust me, if I have ANYTHING to say about the next vacation, I will put my vote in to go back. You are the best. Mahalo!!! Maui Banyan A101 2BR: We had a great time in your condo. My husband particularly loved your bed and the pillows were the best I have ever slept on! I just wanted to let you know we had an amazing time in Maui and loved the condo. It was so clean and nice and lived up to all the pictures. We had some friends have a bad experience and I am really thankful We did not have the same issues. I would definitely rent t again if we find ourselves there again.